So, the ever-greasy Paul Manafort and his water carrier, Rick Gates, have been indicted on charges of money laundering, tax evasion and failure to register as an agent of a foreign government. Although none of this is directly related to the Putin regime’s efforts to influence last year’s US elections, it does show the depths to which US capitalist politics has sunk. 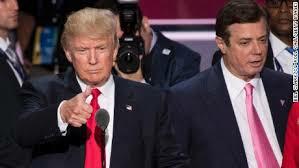 Manafort has a long history of fronting for the Russian oligarchs/mafia, such as Oleg Deripaska, who is reportedly closely tied to Putin. He also worked for the Russian-backed Party of the Regions in Ukraine. He also worked for Russian oligarch Oleg Deripaska as well as Ukraine’s richest oligarch, Rinat Akhmetov. Most (if not all) of the money he gained was parked in offshore banks. In 1996, Manafort bought a condo in Trump Tower for $3.7 million through a limited liability company. This is significant because so many other mobsters and assorted criminals also had condos in Trump Tower — too many for that to be a coincidence. It is also significant because of the rampant use of LLC’s to launder crime gang money in real estate. These indictments also seem to indicate that the mainstream of the US capitalist class has despaired at getting Trump under control through Chief of Staff John Kelly. It also might mean a return to the major influence of Steve Bannon. Any time now, Trump will be denouncing this as “fake news”. But the real fake news was revealed in a little-noticed news release from Facebook. They revealed that 29 million people had read news feeds from the Internet Research Agency, which is tied in with the Putin regime, and that after those feeds were “liked” and shared, the total was 126 million, or 40% of the total US population. This really gets to the heart of social media’s influence in the US. The Putin regime is not the only ones planting such news feeds, which are often real fake news. All sorts of different groups do this, from outright commercial interests to the alt-right and outright fascist groups. And few, if any, of the recipients know the source of these fake news stories. But they rocket around the internet like a ping-pong ball, building the images in people’s minds that are the real determinants of how they think. Of course, any complaints by Corporate America of how the Putin regime sought to influence – and probably did influence – the US elections should be considered in light of how they – Corporate America – has influenced elections in other countries. This includes up to and helping to overthrow democratically elected leaders elsewhere.